Melissa Ingram is an internationally and nationally published and awarded Beadwork & Textile Jewellery Artist, Project Designer, Tutor and Writer. "For me jewellery is an accessory of expression of thy self and not just an adornment. I am inspired to create heirloom quality beadwoven & textile jewellery, jewellery that has meaning and value for the wearer. The addition of vintage or antique beads to a jewellery creation adds elements from the past, that when combined with new elements will ensure a unique and treasured piece of wearable art that will be adored. I have been involved with 'beads' for more than 20 years but within the last 7 years or so I began teaching myself and experimenting with bead embroidery, Soutache embroidery and off loom beadweaving stitches such as peyote (pay-oh-tee), Ndebele (Nuh-deb-belly), Right Angle Weave (RAW) and my stitch of choice Cubic Right Angle Weave (CRAW). My design journey has now embraced Shibori silk ribbon as a design element within bead embroidery. Since then I have not looked back, beading is my passion, my quiet time, my 'to be with myself and centre' time. I work out of a home studio that is literally wall to wall beads. I have two tall 'towers' of 64 shelves that house most of my Swarovski crystal collection which contains both modern and vintage Swarovski crystal beads, stones and pendants that I have sourced globally. I have a wonderful collection of vintage and antique beads, buckles, buttons, West German & Czech glass cabochons, French Limoges, Japanese baroque glass pearls from the 1940's that are still on their original hank and other assorted bits and pieces that I have been gathering for many years. Another area of expertise is the reworking of vintage and antique jewellery pieces and parts. Reworking includes making old new again by using beadweaving to bezel vintage cabochons, refitting of new beads or stones into vintage brooch settings, rings & pendants, restringing or knotting of pearls and so on. Polymer Clay is another love of mine, I incorporate handmade PC creations into my jewellery designs. My first jewellery design project tutorial for the magazine 'Australian Beading' was a polymer clay project 'Wearable Art Framed Pendants' (Australian Beading magazine, Vol.3 No.4, Pg. 46 "Perfectly Framed" by Melissa Ingram). This line of jewellery was very popular and I still make them now and again. I was a member of the Etsy Beadweaving Team and the Dust Team but had to withdraw my membership due to other beadwork commitments. 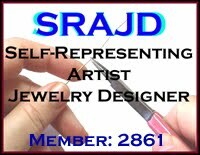 I am a memberof the group SRAJD (Self Representing Artist Jewelry Designer). I am no longer a member of the Victorian Bead Society.